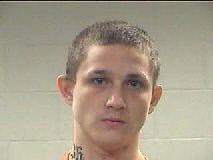 Cody Lamar White, 17, of Livingston, was charged with burglary of a habitation and possession of a controlled substance. Burglar Caught Stealing from Home and In Possession of Methamphetamine, INDIAN SPRINGS, August 27, 2013 - The continuing investigation of residential burglaries in the Indian Springs subdivision has resulted in the arrest of two suspects. On Sunday night (August 25) Detectives with the Polk County Sheriff’s Office received information a home was going to be burglarized somewhere on Adams Road in Indian Springs. The Sheriff’s Office responded by establishing surveillance on Adams Road. At around 2:00am a Detective observed a vehicle drop off two subjects on Adams Road, the suspects immediately kicked open the front door of a house and made entry. As the Detectives responded to the house they observed the subjects exit the front door carrying a television. Cody White of Indian Springs was arrested and charged with burglary of a habitation. During a search of the suspect a small bag of suspected methamphetamine and a glass pipe was found in his pocket. White was also charged with possession of controlled substance. The other suspect (a juvenile) who was also from Indian Springs, was charged with Burglary of a Habitation and transported to the Juvenile Detention Center in Conroe. Detectives with the Sheriff’s Office are continuing the investigation of Burglaries in the Indian Springs area and expect to make more arrests. On March 25, 2013, Cody White was charged with aggravated sexual assault of a child.